Having already made applesauce and apple butter, and also pear sauce (make it the same way as applesauce— smooth or chunky but with some ginger —it’s good! ), I was searching for some low-fat ways to use up the rest of this bounty that keeps coming my way (I’m not complaining!). I didn’t want to make pies this year because we’re trying to keep off the weight we lost earlier in the year. (But, if you want to make pie, there are a couple of yummy pies on the recipe list below.) So, #1, I made pear chutney, because we love chutney and it keeps well, plus I had everything I needed in the house already. I’ve been asked, “What do you serve chutney with if you don’t eat meat or cheese?”. Well, curries and other Indian dishes, of course; veggie “sausages” and seitan; smoked tofu (this is a terrific combination!) or tofu cream cheese on crackers—and that’s just for starters! 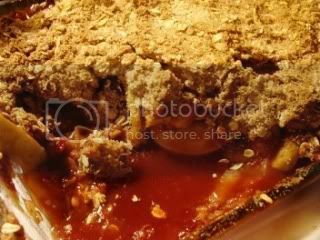 And, #2, I had some cranberry sauce leftover from Canadian Thanksgiving, and I decided to mix that with an impressive amount of apples to make a very large and low-fat apple crisp, some of which could be frozen for a future desserts. Both of these recipes were hits and now I’d like to share them with you. This chutney is both colorful and delicious. Heat the oil in a large pot. 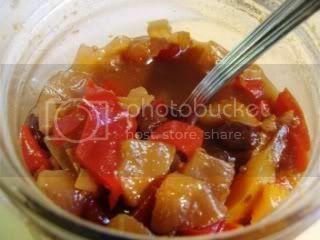 Sauté the onion, pepper and garlic in the oil over medium heat until tender. Add the pears, vinegar, water, mustard seeds, ginger, orange peel, salt, cayenne, cinnamon, brown and white sugars, and raisins. Bring to a boil, reduce heat and simmer for 45-60 minutes, or until the chutney is thick but the fruit still holds its shape. Taste for salt and pepper. Cool completely. Refrigerate in tightly-sealed jars until ready to serve. OR water bath can in sterilized half-pint jars. Nutrition (per 2 tablespoons): 83.6 calories; 10% calories from fat; 1.1g total fat; 0.0mg cholesterol; 216.1mg sodium; 144.9mg potassium; 19.7g carbohydrates; 1.6g fiber; 15.3g sugar; 18.1g net carbs; 0.5g protein; 1.4 points. 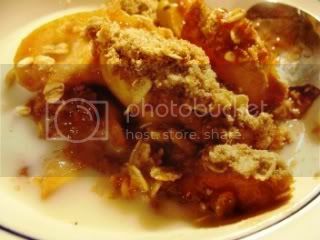 This crisp uses up about 4 lbs of apples and makes a big 9 x 13-inch dish of delectable dessert! I only used 1/4 cup of Earth Balance for 12 servings, which works out to 1 teaspoon for each serving. I used some homemade cranberry sauce left over from Canadian Thanksgiving. Preheat the oven to 375° F. Grease a 9 x 13" baking dish with a little oil or Earth Balance. Make the Topping by mixing together the oats, flour, sugar and salt in a medium bowl. Cut in the Earth Balance with your fingers until crumbly-- set aside. Core and slice the apples about 1/4" thick. 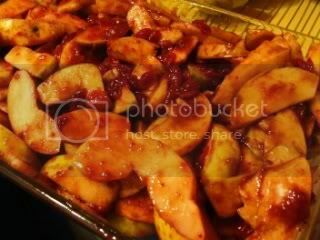 In a large bowl, mix the sliced apples with the cranberry sauce and sugar, and then sprinkle with the cornstarch and cinnamon and mix well to evenly distribute it. Pour the Filling into the prepared baking dish and spread it out evenly. Cover with the Topping and press it evenly over the fruit. Bake for about 70 minutes. Cool it for at least 20 minutes before serving. NOTE: you could divide this between two smaller baking dishes and freeze one of them for a later date-- that's what I did! In that case, bake for only 60 minutes. Serve plain, or with nondairy milk or soy creamer poured around it; or with plain soy or coconut yogurt; or with your favorite nondairy whipped topping or nondairy vanilla "ice cream". Nutrition (per serving): 428.7 calories; 10% calories from fat; 5.1g total fat; 0.0mg cholesterol; 149.1mg sodium; 410.6mg potassium; 96.0g carbohydrates; 7.5g fiber; 68.7g sugar; 88.5g net carbs; 4.7g protein; 8.2 points. yummmm, pear sauce/butter sounds awesome! i'm totally into making jam etc. right now and getting into canning and whatnot. so fun! I made an apple based mostarda earlier this week too. However, I didn't add any bell pepper to mine. That is an really interesting addition. Thanks for the suggestion.